This Wireless license plate backup camera system with night vision is mounted by screwing your current license plate screws through its brackets; it’s a very simple installation. The camera can also be adjusted by angling the camera up or down so you can get the perfect view of your car. 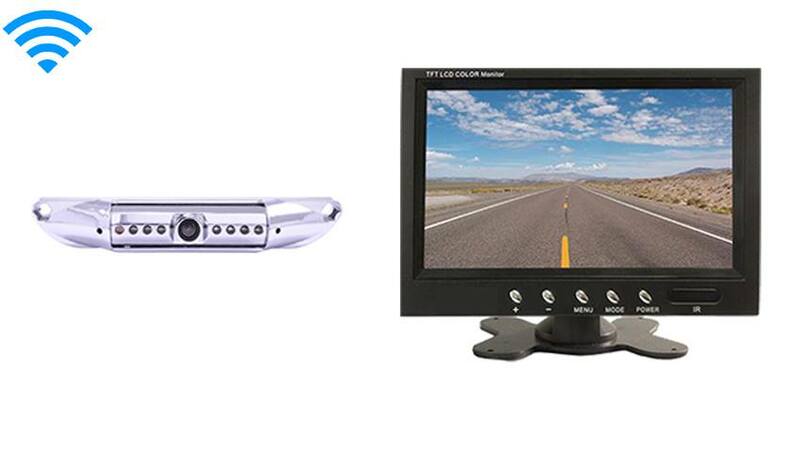 The CCD lens is the clearest and highest quality camera TadiBrothers sells, also called the HD Backup Camera. There is no need to drill any holes or install mounting brackets. The license plate camera has a 120° angle which is best for Cars, SUVs, and Trucks. With 120° everything behind the vehicle can easily be seen, it is also color, waterproof and has military grade night vision. The camera and mount are made of steel for ultimate durability in the roughest weather conditions. What do the backup camera angles mean? Check out our commercial grade heavy duty license plate rear view systems with Built-In Digital Wireless for RV, trailers, and trucks with 150ft digital wireless range. I have seen back-up camera//monitor systems that provide lines on the monitor image that depict the path your vehicle is moving in. Do you have such a system? Yes they do but I can be turned off as well. does the camera wire into the hot wire from your lights on the rear of the vehicle. Yes you can do it that way. You can also install it on your reverse lights so it only works in reverse. Or any constant power source such as a rear light that is always on and then the camera is always on. Will they work with a pick-up truck? Many wireless cameras do not.